Phantoms netminder Ryab Bainborough is beaten by a late Basingstoke goal. Photo: �2018 Tom Scott. All rights reserved. Peterborough Phantoms pressed the self-destruct button as their NIHL Division One South title hopes were hit last night (January 27). The city team slipped to a 5-3 defeat against fellow championship chasers Basingstoke at Planet Ice – and they only had themselves to blame. Ales Padelek celebrates the first goal of the game for Phantoms against Basingstoke. �2018 Tom Scott. All rights reserved. Phantoms conceded three short-handed goals in the space of five mad minutes during a staggering second-period collapse that had to be seen to be believed. They had earlier played well and also rallied gamely as they attempted to recover, but they were left to ponder a blank weekend which could prove to be pivotal in the race for honours. Koulikov’s men were also masters of their own downfall when being beaten 4-1 at table-topping Swindon the previous evening when the majority of the damage was again done in the middle session. Even more concerning is the concession of five short-handed goals in three games – an alarming statistic for a team whose success in recent years has always been built on firm defensive footings. Koulikov said: “A team competing for the title can’t really afford to have a weekend without any points, but that is unfortunately what has happened. “I can’t fault my players for the passion and desire they showed during a game in which we dominated for long periods, but it is clear that we cannot continue to conceded goals in the manner we are doing. “We have conceded six goals in the second period across the two nights – three in Swindon and three more against Basingstoke. Four of those were short-handed and another one came a couple of seconds after a powerplay ended. “That is obviously something we have to correct and we’re also finding it hard to put the puck in the net ourselves. “We’re going through one of those spells when things aren’t going our way and that means it is even more important we get things right defensively. 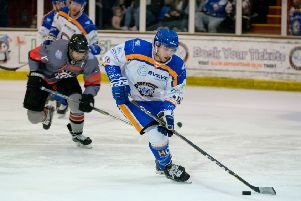 Phantoms hit the front in a hard-hitting opening period against Basingstoke when Ales Padelek struck on a powerplay. The Czech veteran forced the puck in during a scramble after an initial shot from Captain James Ferrara was saved. It was a deserved breakthrough for a performance full of energy and aggression, but the visitors also posed plenty of threat themselves. They struck a post before levelling through player-coach Ashley Tait, who put away a rebound after Richard Bordowski was denied. And Tait was the major beneficiary of Phantoms’ charitable performance in the second period as he quickly completed his hat-trick with a pair of short-handed efforts. 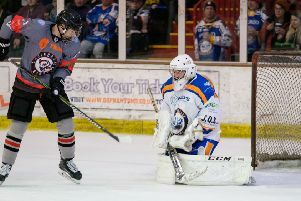 Team-mate Russell Cowley then got in on the act as Phantoms conceded for a third successive powerplay. They responded by pulling netminder Jordan Marr and replacement Ryan Bainborough made a series of fine saves to prevent further damage before Phantoms finally managed a goal at the right end during a powerplay as Martins Susters’ shot through traffic gave them hope. Susters was then involved as Petr Stepanek cut the arrears further with a little under six minutes to go. The Czech ace’s strike set up a grandstand finale as Phantoms chased a leveller with their tails up, but the comeback bid was soon ended when Alex Sampford finished smartly at the end of a blistering Basingstoke breakaway. It was unfortunately fitting of the Phantoms performance that the goal stemmed from a sloppy giveaway in the offensive zone from defenceman Scott Robson. Despite sacrificing Bainborough for an extra skater and piling on the pressure in the closing couple of minutes, there was no way back for Phantoms. They have dropped to third in the NIHL Division One South standings following their blank weekend and now trail leaders Swindon by three points. Basingstoke sit second, a point behind the pacesetters. Phantoms face the same two teams when returning to league duty over the weekend of February 9 (Basingstoke away) and 10 (Swindon home). But they now switch their attention to the NIHL South Cup this weekend with a two-legged semi-final showdown against Bracknell. Koulikov’s men travel to Berkshire this Saturday (February 2) before staging the return clash at Planet Ice the following day (February 3).